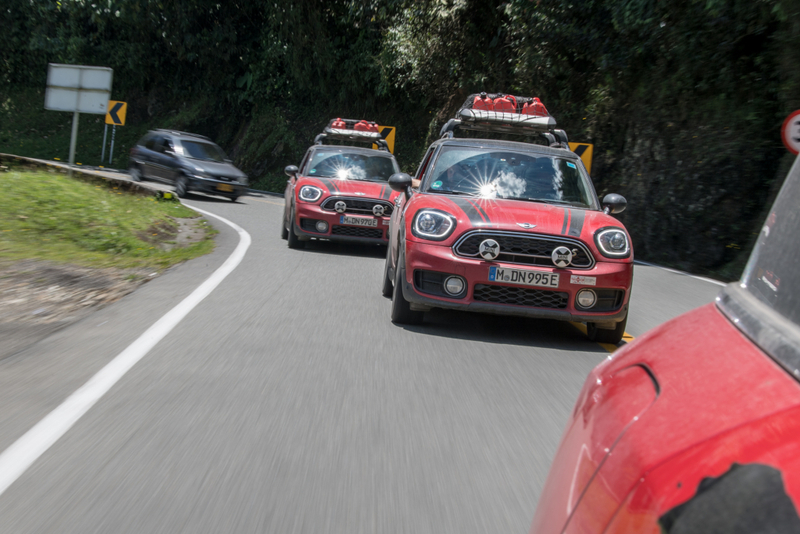 “How on earth did you get this trip like this signed off?” we ask Andreas Lampka, Mini’s head of communications in Germany and the man responsible for the majority of the planning involved in this epic adventure. “I bought it up at the very end of a meeting, we all voted for it and every one agreed,” he explains. “But it wasn’t until I started planning it that my bosses realised it wasn’t the 2,000 mile Carrera Panamericana race, but a 10,000-mile journey through most of South America,” he adds. 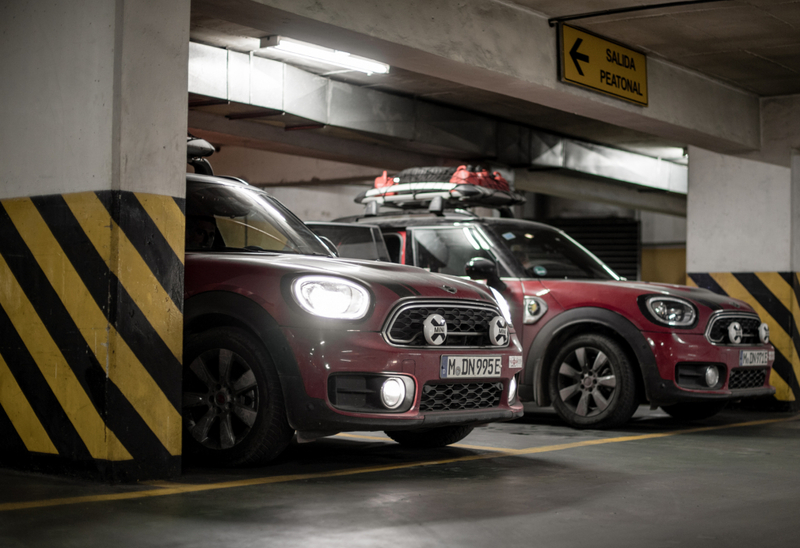 That’s right, Mini has opted to tackle a route that would see three Countryman plug-in hybrid vehicles cover over 10,000 miles from a starting point in Dallas, Texas to the final destination in Ushuaia, Argentina and the beautiful surrounds of Patagonia. In doing so, these hardy little vehicles would traverse 12 countries, numerous tetchy border crossings and some of the most famous cities in South America (for both good and bad reasons). By all accounts, the journey so far has been fraught with lengthy border crossing procedures, superfluous paperwork, expensive bribes, shipping delays and the general chaos that’s attached to transporting four German-registered vehicles (the support vehicle is a VW van) through a selection of notoriously corrupt countries. 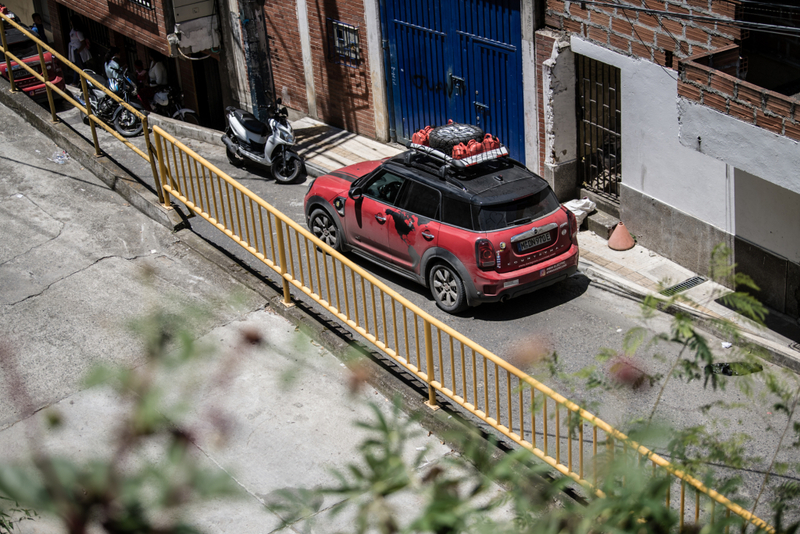 Rather than spend a couple of months attempting to complete the entire Pan American trek, Mini has invited us to complete one section of said trip – a 1,000-plus mile odyssey that meanders through the heart of Colombia and briefly crosses the border into Ecuador. Leaving London late on a Sunday evening, we arrive in a deserted Bogota airport in the early hours of the morning, following a 10.5-hour Avianca Airways flight. Immigration is almost empty, with a few officials snoozing under coats as footsteps reverberate off the shiny airport surfaces. However, there’s the first of many small hiccups in so much as the sparse itinerary we received didn’t feature any mention of hotels at destination, leaving a pretty vital section of the immigration form worryingly blank. The stony-faced official immediately picks up on this fact and there ensues a comical trawl through emails to prove we aren’t up to anything illegal and a rapid Google search to pluck the name of a hotel out of thin air, so we can catch our connecting flight to Cartagena. 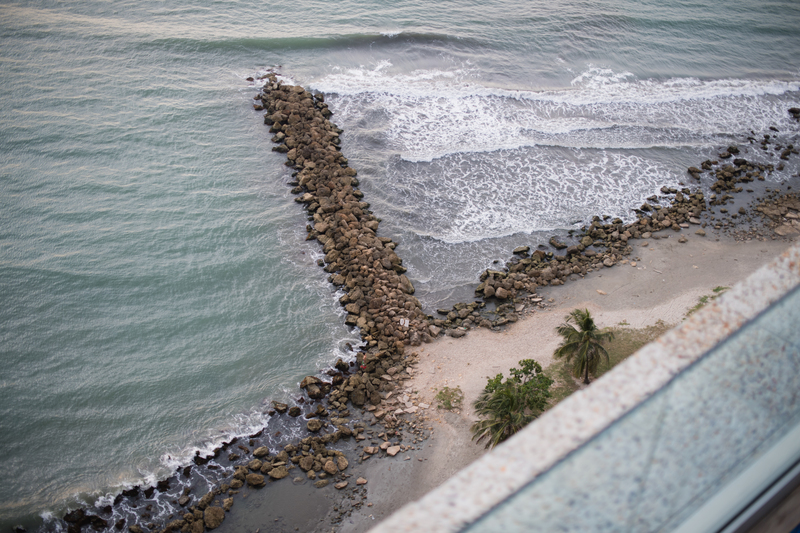 Thankfully, it works and we’re soon checking in to the Hyatt Regency on Cartagena’s ‘Little Miami’ strip, which is actually of a thin slither of land, officially named the Bocagrande, which juts out into the Caribbean Sea. Popular with American tourists, this area is awash with high-rise hotels, white-floored shopping malls and grey beaches that somehow lack the golden sands and azure waters of the more famous Gulf Stream islands. 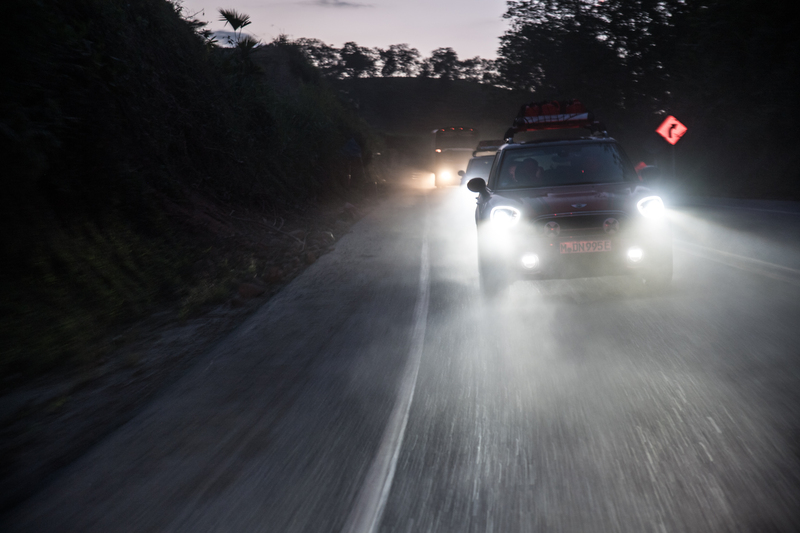 It turns out the trip is behind schedule due to shipping issues from Panama, with officials citing storms out to sea, delays and other such excuses why the three Minis have been stuck on a ship for thirteen days, as opposed to the proposed two. The mood among the crew is sombre, as daily trips to the docks only lead to empty promises about the delivery of vehicles, so it gives us some time to explore the city. 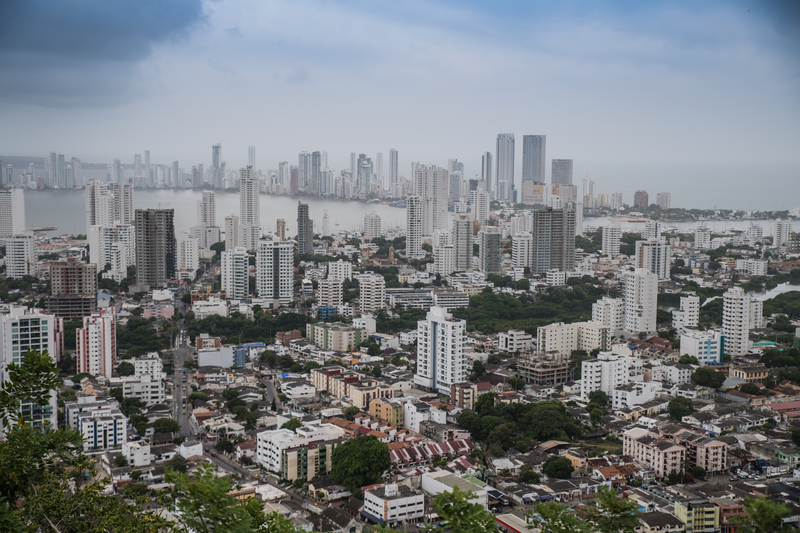 Cartagena is split between the old and the new, with the beautiful streets of the walled city, built around 1614, just a short hop from the glass-fronted monoliths of the Bocagrande. These cobbled alleys and ancient buildings make for the most vibrant day and nightlife in the city, with numerous bars, graffiti-fronted cafes and hidden restaurants attracting the majority of tourists. According to our local guide, Rafi, tourism accounts for around 70 per cent of jobs in the area, so there is little to fear when wandering the streets at night, so long as you’re generally savvy. 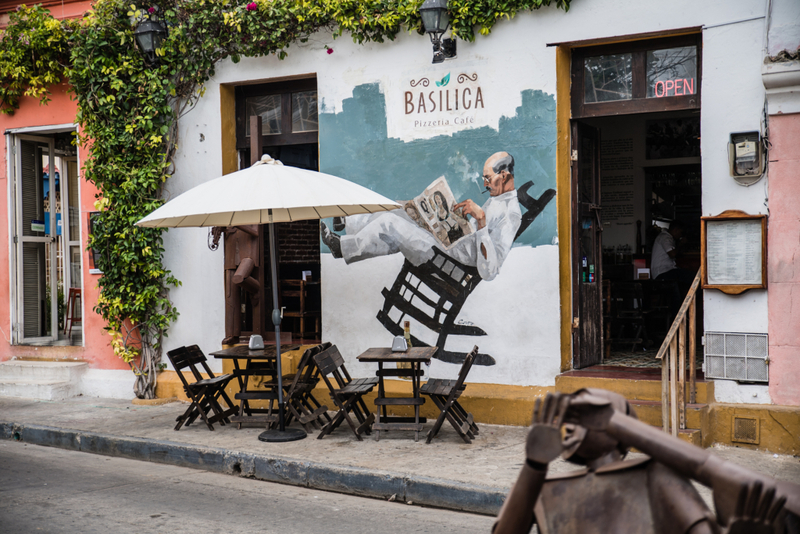 But taking in the various narrow calles and carreras during the day is just as fun, with the UNESCO heritage site offering tax-free living for a year to those occupants of the area with the most beautiful, flower-laden balconies. The result is an area that’s awash with colour and history, while grid-like formation makes it easy to meander for hours and discover something new with every turn. Outside of the walled city, La Popa Monastery, which dates back to 1607 and affords some of the best views of the city thanks to its extreme elevation, proves a worthwhile visit for photographic reasons, while the Castillo San Felipe de Barajas (built in the 1500s) is so jam-packed with gory history, it takes a couple of hours to navigate with our guide. 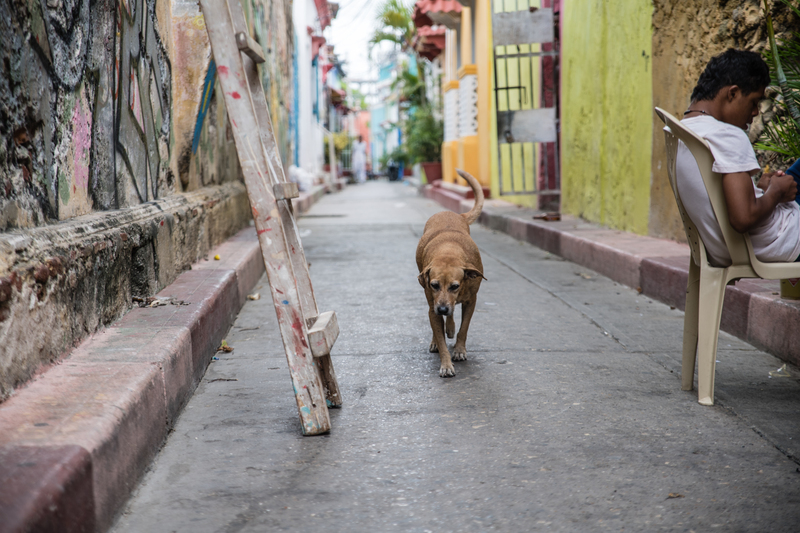 At night, we take in the Shoreditch-esque surrounds and fusion cocktails of the Alquimico Bar, dodge prostitutes, enjoy some authentic salsa action in Café Havana and purchase knock-off Cohiba cigars from the numerous street vendors that buzz around the city streets. We rapidly realise that nothing happens particularly quickly in Colombia, be it checking in to a hotel room, ordering lunch or releasing three Minis from the port of Cartagena. 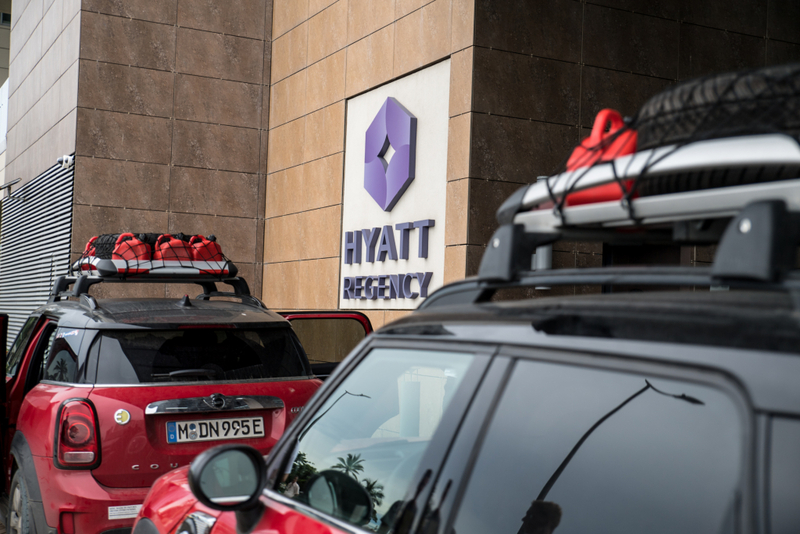 The major delays in clearing customs means the remainder of the expedition is now on an extremely tight schedule and by the time we see the bright red hatchbacks pull up outside the hotel, we only have a couple of hours of daylight left. Because of this, we now face a 400-mile hack south towards Medellin, which Google Maps suggests should take a solid 12.5 hours without a single stop. Alas, that estimated time of arrival would slowly creep up with every slow lorry, errant donkey, broken road surface, lorry pile-up and road-wrecking landslide encountered along the way. 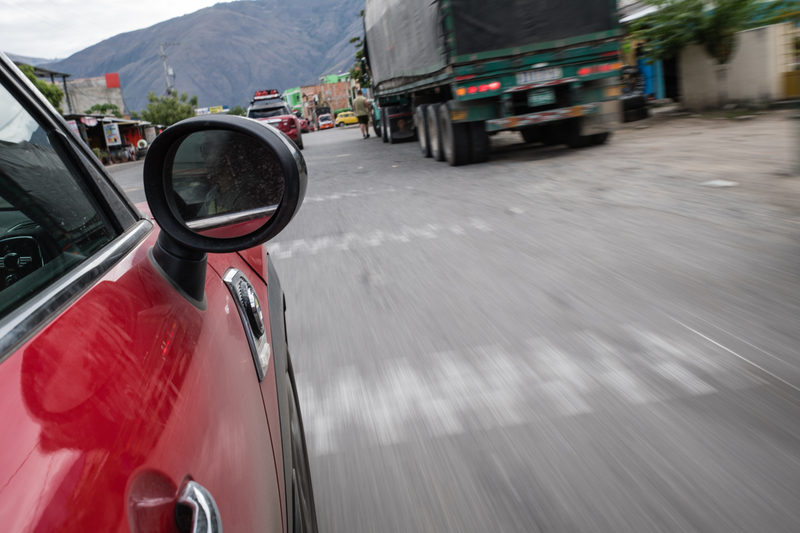 Driving through Colombia is predictably hectic, with nothing in the way of lane discipline or road laws most Europeans are used to, but very little can prepare a driver for the never ending jams, hold-ups and time-draining events that occur on the road. With three drivers rotating shifts behind the wheel (a fellow journalist and a member of the Mini support crew occupy the other seats), we finally pull into the Intercontinental Hotel, Medellin, at around 5am the following day. No amount of Red Bull and blisteringly strong Colombian roadside coffee can stave off the fatigue of such a punishing drive and to add insult to injury, the journey has devoured any time we could have otherwise spent enjoying Medellin’s buzzing nightlife. The metropolis that was once labelled “the most dangerous city on earth” by Time magazine has now transformed into a creative hive of colour and activity. An extensive public transport system now connects the many barrios and neighbourhoods that once served as recruitment camps for Pablo Escobar’s notorious cocaine empire, allowing residents to commute to newly created jobs and create business of their own, which has helped transform the image of the city. 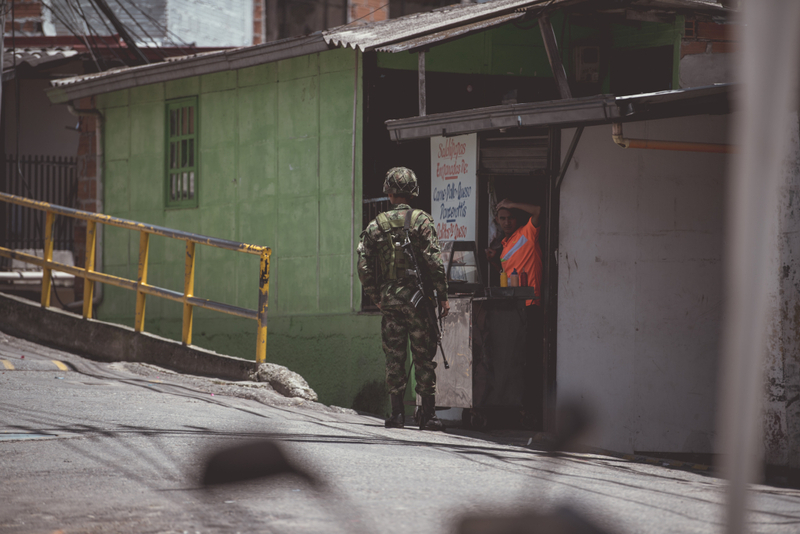 Granted, tourists still arrive in their droves to indulge in the gruesome history of Colombia’s warring drugs cartels made famous by hit Netflix show but Medellin is now so much more than that. Museums, bars, award-winning restaurants, stunning public spaces and boutique hotels now thrive in the lush green valley that is nestled between two Andean mountain ridges. 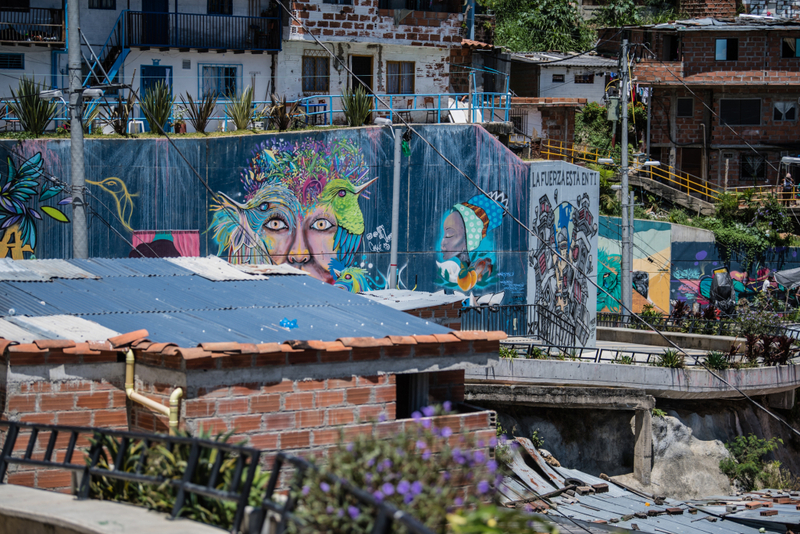 A whistle-stop walk around the famous La Comuna 13, once on of Medellin’s most dangerous neighbourhoods, is all we really have time for, but proves to be well worth the detour. 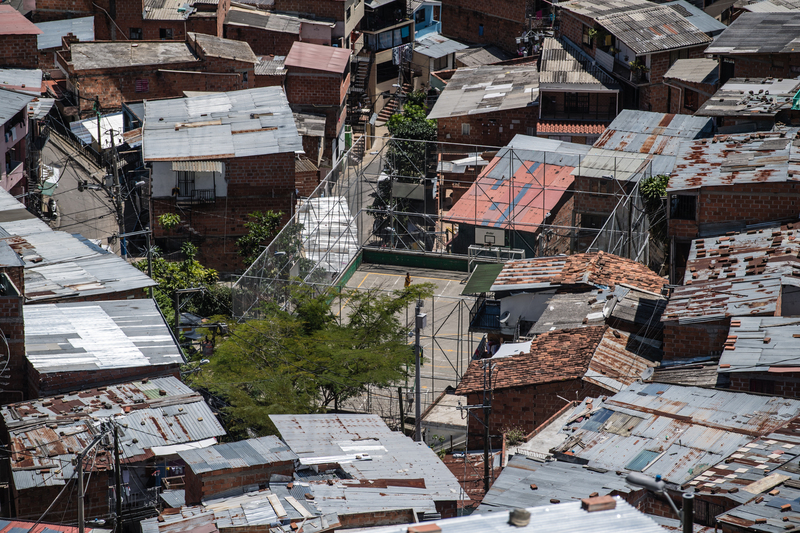 It affords some of the most amazing views over the city and an inside look at the alleyways, shacks and escaleras electricas that join these once marginalised communities with the big city. There’s also myriad retina-popping graffiti that adorns the walls clinging to the hillside, with many murals telling stories of ruthless gang wars of yesteryear, the struggle with drugs and a violent past. The locals are well versed in dealing with the odd ‘gringo’ and typically offer a smile and a wave to anyone with a camera, while a walking tour is advised if you really want to get under the skin of the area, but the heavily armed police presence claims that it is still not advisable to get lost in the bamboozling maze of alleys and rat runs at night. Our dash from Medellin to Cali is by far the most frustrating yet, with the average speed on the Mini’s digital readout rarely getting above around 20mph. This is chiefly down to the single track roads, choking HGV traffic and the fact that Highway 50, supposedly a major arterial road, is nothing more than a dusty track in parts, which has been squeezed into narrow, single-file traffic lanes by landslides and questionable local engineering works. The journey is a continuous loop of backed-up traffic, a few miles of bumpy terrain, followed by another queue as we wait for the lines of oncoming vehicles to filter past. 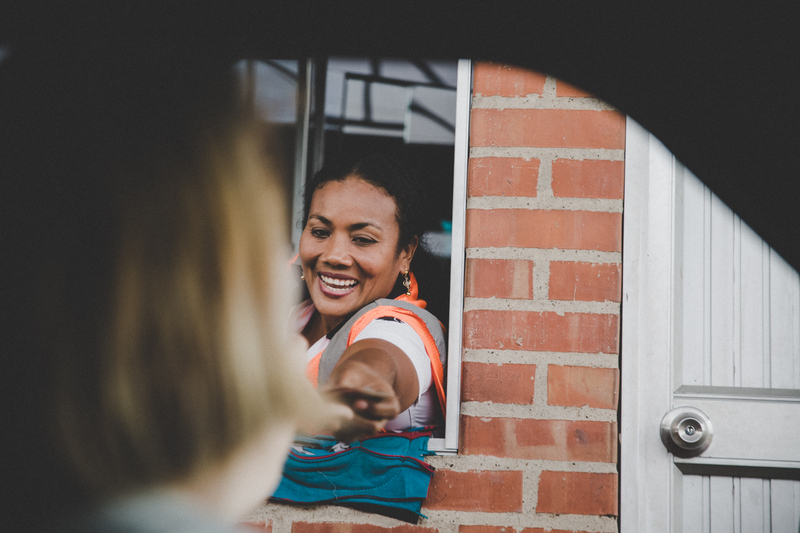 We clocked one of these stops at well over an hour, with most locals leaving their vehicles to buy drinks and snacks from the entrepreneurial roadside vendors, light a cigarette or play a game of dice. 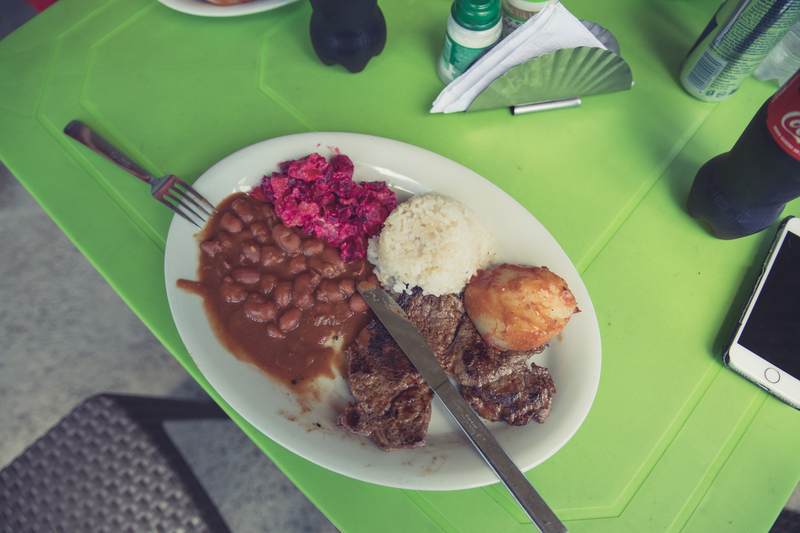 As a result, lunch is hastily ingested at a small cafe along the route, its owners frying slabs of beef, baking beans in a wood-fired oven and serving it all up with rice, a hunk of potato and some sort of beetroot coleslaw. The scenery is staggering, too – the sapphire sky contrasting with the deep green of the vegetation that carpets the hillside. Thankfully, the roads get smoother once we make it past Cartago and Buga, but it means we arrive at our hotel in Cali (home of the other infamous cocaine cartel) just in time for a bemused night porter to check us in. The punishing amount of miles required to complete Mini’s challenge of making it to Ushuaia in time and somewhere near on-budget means the days will largely be spent in the vehicles, racking up the miles. Mini’s hybrid technology has so far proven to be extremely capable, with the on-board battery packs neatly recharging down and via kinetic braking, meaning it’s possible to cruise at low speeds on electricity alone. Predominantly designed for the city, the plug-in hybrids have tackled some serious terrain with very few problems. We notice the air conditioning in our vehicle starts to play up after a full day of driving, but it’s easily solved, while the small tanks means we’ve had to brim the tanks frequently via fuel station stops or the red cans attached to the roof rack when said stations run out of gas. Salty snacks, Spotify and sugary drinks help pass some of the more monotonous sections of road, but there’s always something going on out of the window: a scooter carrying four people, a roadside bar pumping salsa music, a man taking a machete to a truck tyre and a random police check parting travellers with their pesos. 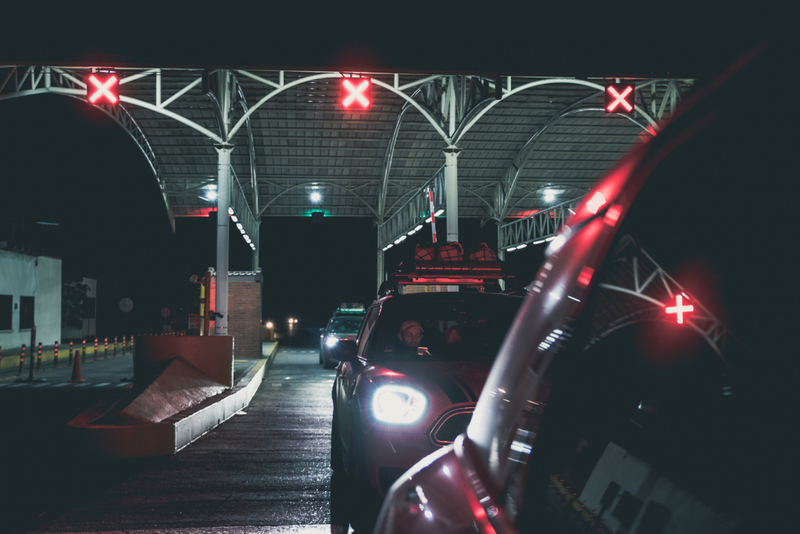 The most painful border crossing (Mexico to Guatemala) has taken the team six hours, so it’s completely understandable that we want to make proceedings as easy as possible. In an attempt to mitigate the pain, we hole up for the night in the quiet border town of Pasto, which sits around 2,500m above sea level and is home to a chocolate-box, if a little quiet, town centre. 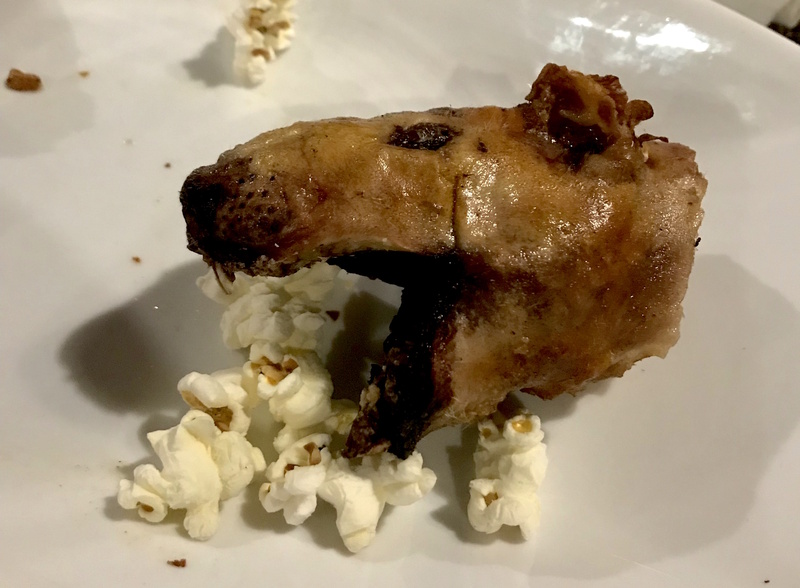 The hotel’s restaurant serves up a local delicacy of roasted Cuy (that’s guinea pig, BTW), served on a bed of salty popcorn with slivers of chopped liver delicately strewn over the dish. If you’re vegan, look away now, but it tastes like fatty chicken, with hints of duck and a skin that’s not far off a bag of pork scratching. A night of sleep that’s peppered with Cuy-induced indigestion gives way to an early start, as we embark on the crossing over into Ecuador. 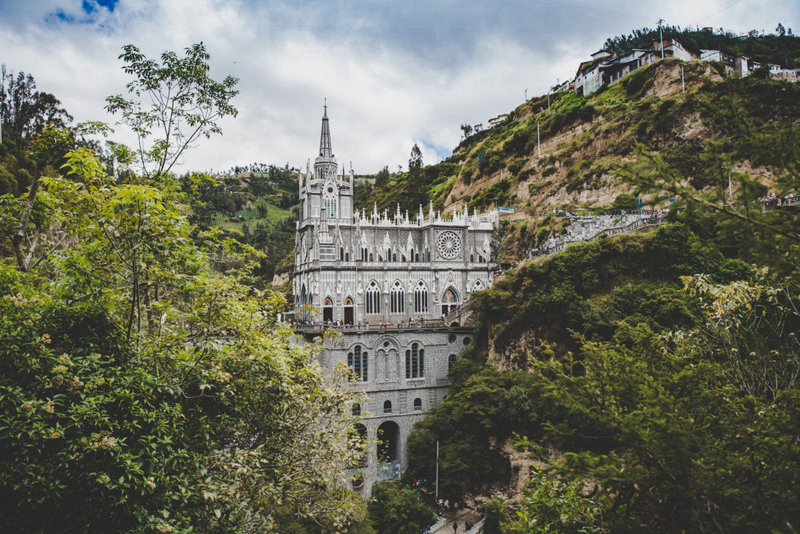 There is time for a brief stop at Las Lajas Sanctuary – quite possibly the world’s most beautiful church, which majestically straddles the Guaitara River and provides the perfect opportunity for some photos. 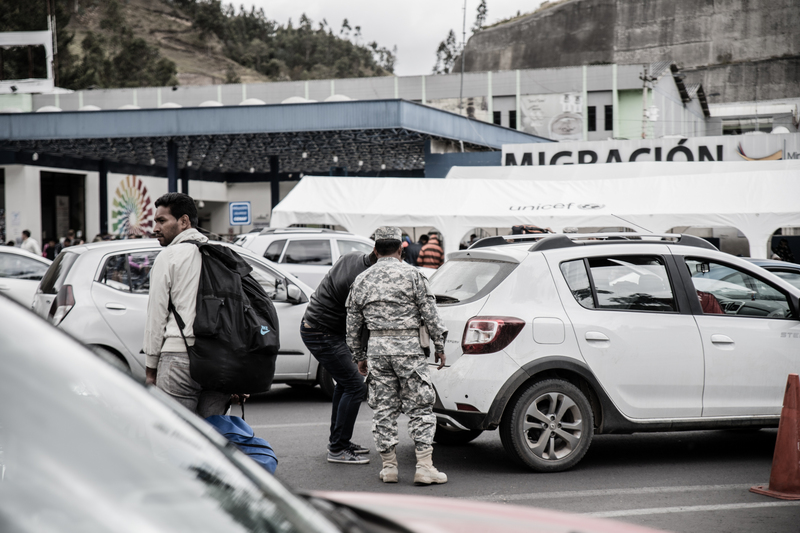 But Zen-like tranquillity of the place is soon forgotten as we reach the border, which is predictably frenzied, with lengthy queues to attain the correct passport stamps to leave Colombia and equally long waits to obtain the correct documents to enter Ecuador. Two hours and many packets of crisps later, we wave goodbye to Colombia, the expensive tolls and rutted roads making way for smooth tarmac and instant epic vistas. 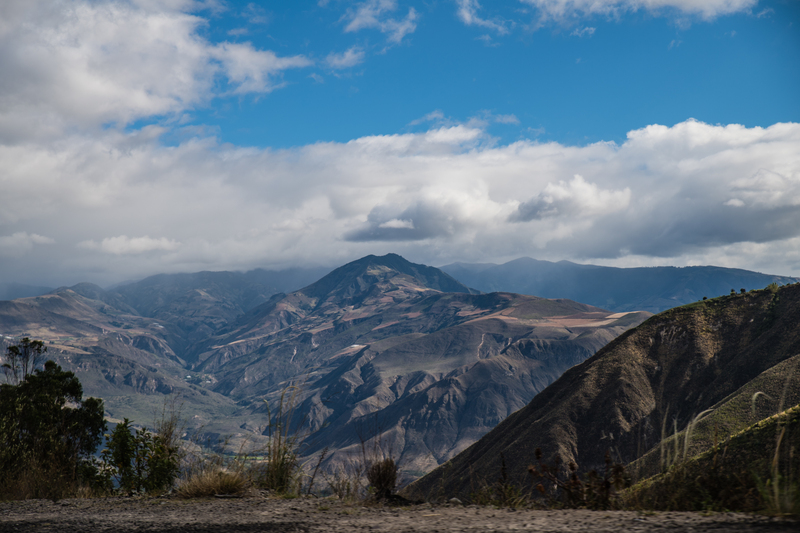 Ecuador is simply breath taking, the Cayambe volcano and numerous Andean peaks visible from the roads, which snake and carve their way through deep valleys and often crest cloud-busting summits. 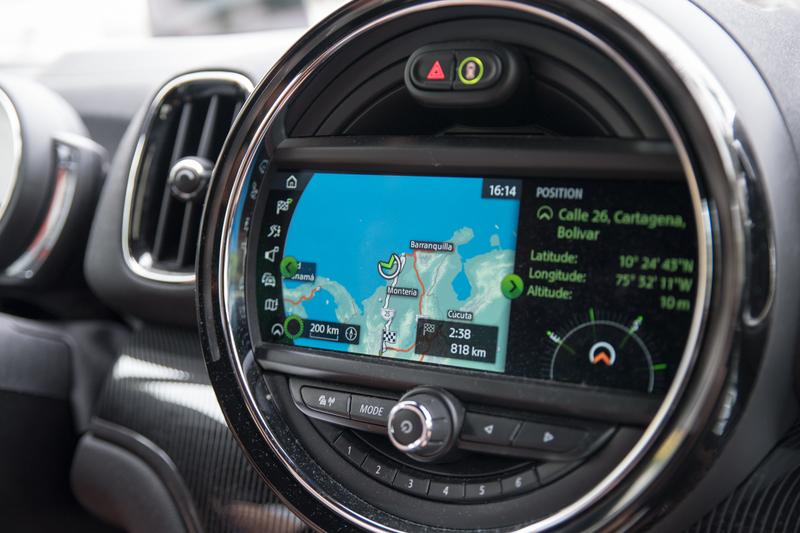 The Mini’s sat nav suggests we reach an altitude in excess of 3,500m at points, which goes some way to explain the breathlessness felt whenever we walk a few feet during toilet breaks, while the same system also points out the fact that we crossed the equator – the digital latitude readout swinging from north to south. We reach Ecuador’s capital for sundown, but there’s plenty of opportunity to appreciate its beauty. Ribboning tarmac surrounds the city, which looks as if it has been poured into the mountainsides from a great height, and we circulate the road system for what feels like an eternity before being fired directly into the city centre. Quito seamlessly blend the old with the new, the historic centre (another UNESCO World Heritage site) plays host to buildings that date back as far as the 1500s, while the financial district is awash with modern glass high-rises and expansive hotel sites. Meander the avenues at night and it’s possible to get lost down one of the many La Ronda streets, which is the best bet if you’re looking for quirky bars, authentic restaurants and some nightlife. We drink steaming glasses of Canelazo, an Ecuadorian take on a mulled wine that’s made from exotic fruit juice and strong sugar cane-based alcohol called. Aguardiente. It warms the core and does a good job of staving off the bite of the cold winds that blow down through the city from the mountains. And with one final toast over more Canelazo, we put the finishing touches on a monumental but brutal road trip, with another batch of hardy drivers flying in to pilot the cars through Peru, Chile and Argentina. God speed. You’re going to need it. A version of this article appeared on Amuse. All imagery by the author.